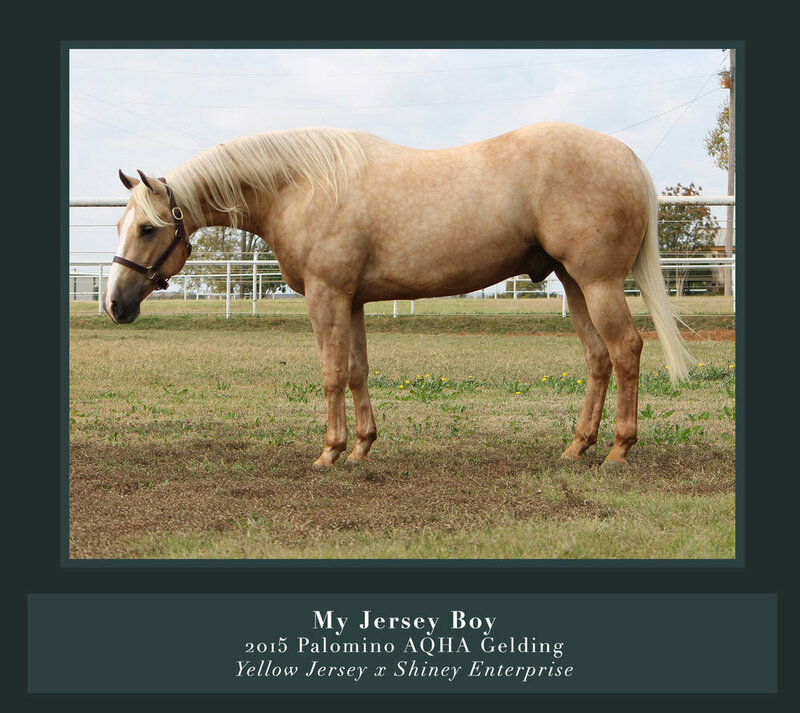 2015 Palomino Gelding by Yellow Jersey out of Always Gotyer Gunsup. Always Gotyer Gunsup (Gunner x Always A Dunit) is the earner of $171,401, an NRHA Open Futurity Finalist, NRBC Non Pro Classic Champion, multiple NRHA Derby and NRBC Non Pro Classic top five. She is a producer of over $70,000. 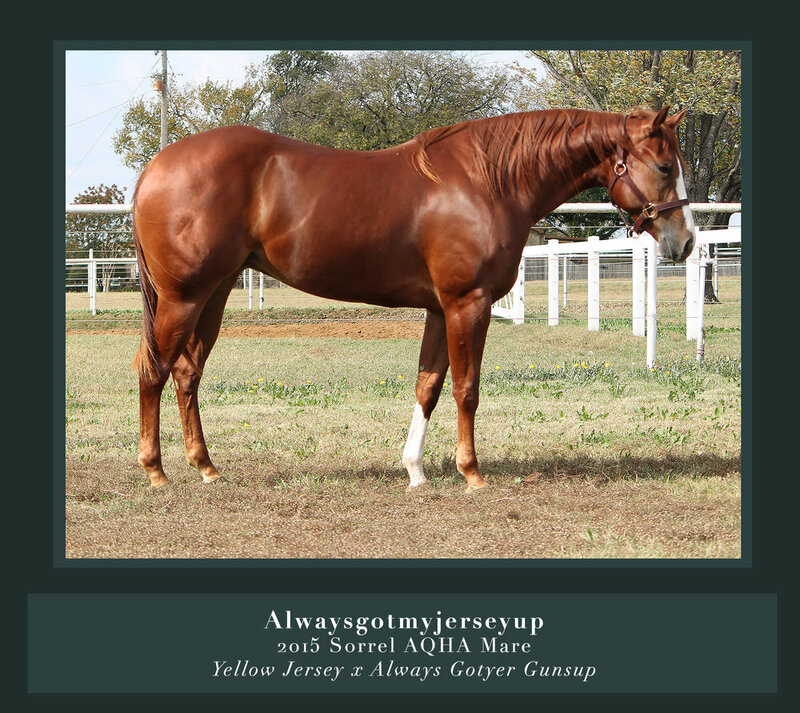 2015 Sorrel mare by Yellow Jersey out of Always Gotyer Gunsup. Always Gotyer Gunsup (Gunner x Always A Dunit) is the earner of $171,401, an NRHA Open Futurity Finalist, NRBC Non Pro Classic Champion, multiple NRHA Derby and NRBC Non Pro Classic top five. She is a producer of over $70,000. 2011 Palomino Stallion by Colonels Smoking Gun out of Custom Made Dunit. Custom Made Dunit (Hollywood Dun It x Custom Red Berry) is an NRHA money earner and producer of $281,313+. Custom Made Gun has NRHA earnings of $101,874. 2015 Red Dun mare by Yellow Jersey out of Dun Its Deja Vu. Dun Its Déjà Vu (Hollywood Dun It x Miss Okie Too) is an earner of $26,288 and has produced earners of $167,007. 2015 Sorrel Gelding by Gunners Tinseltown out of Custom Made Dunit. 2015 Palomino Gelding by Yellow Jersey out of Shiney Enterprise. Shiney Enterprise (Smart And Shiney x My Royal Enterprise) is an earner of $72,924, among her accolades are NRBC Non Pro Classic Reserve Champion, NRHA Derby Non Pro multiple top five, and AQHYA Intermediate World Champion. 2014 Palomino Mare by Hollywoodstinseltown out of Shiney Enterprise. NRHA money earner. 2014 Bay Stallion by Mister Nicadual out of Customized Gunner. Customized Gunner (Gunner x Custom Made Dunit) was the 2012 NRHA Non Pro Futurity Co-Champion; 2012 SWRHA Non Pro Futurity Champion; 2012 Ariat Tulsa Reining Classic Non Pro Futurity Champion; 2013 Cactus Reining Classic L4 Non Pro Champion; 2013 NRBC L4 Finalist; 2013 High Roller Reining Classic Whizkey N Diamonds 4 Year Old Stakes High-Scoring Mare earning a total over $93,000. Customized Dually is an NRHA money earner.